Our Open Chord School of Music is where Knoxville’s music lovers become musicians. We offer music lessons to educate children and adults of all ages in the Art of Music. Through offering instruction and lessons on guitar, drums, bass guitar, ukulele, mandolin, banjo we aim to build and support the local music community here in Knoxville. We are proud to have a growing network of Knoxville’s finest music instructors. Even if you’re looking for lessons on an instrument that we don’t currently teach, just stop by and we’d be happy to recommend a local musician that offers instruction for your instrument. We believe Music is an essential building block in a child’s ability to learn. For adults, it offers a wonderful, creative outlet. We believe that learning and playing music should be fun, first and foremost. For all ages, music is a joy, a creative outlet and a healing force. Unfortunately, music is being taught less and less in our school systems, but that does not make it any less important. Multiple studies have consistently shown that learning music at a young age helps with other subjects, especially math. Our Open Chord Music Store is a full service music store that carries Electric Guitars, Acoustic guitars, amplifiers, drums and percussive Instruments, guitar pedals and music accessories. 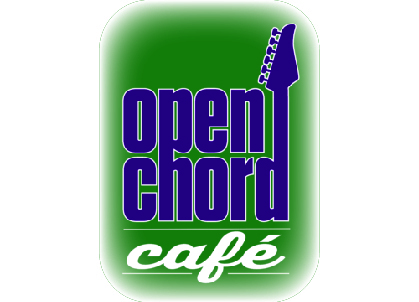 We love the musician community of Knoxville so we created Open Chord Cafe – a place for like minded music lovers to hang out, meet up and eat great food. With our laid back atmosphere, full menu, coffee bar and huge beer selection, you’re going to find yourself hanging out and meeting some cool folks. Our Cafe becomes a wonderful waiting area where parents and friends are invited to relax with a coffee or something from our menu while your student completes their lesson. With comfortable seating, a reasonable menu and always free Wi-Fi, The Open Chord Music Cafe can be a nice break from your hectic schedule. Our Open Chord Live Music Venue covers a variety of performances – from acoustic and pop, hard rock and blues, to open mic performances, poetry slams and storytelling. From national touring acts to local musicians and bands, we focus on quality live concerts and performances. Our intimate listening room atmosphere will make you feel immediately at home with the performers. Open Chord is more than music. If you are looking for a cool place to host a private party or special gathering Open Chord can offer a variety of rental options. We are augmenting our professional sound system with video projection and recording systems to offer Knoxville businesses and organizations a great venue for workshops, seminars, client mixers, small film festivals and more.